This weekend’s Frostbite 2017 is a tournament solely devoted to Super Smash Bros. for Wii U. In the pools, anyone is fair game, as Elliot “Ally” Bastien Carroza-Oyarce learned after getting upset by a relatively unknown Kirby player. Carroza-Oyarce is one of the best in the game, ranked in the top three on community site Smashboards and the runner-up from this year’s Genesis, one of the premier Smash Bros. events. So when he came up against a Kirby player named “Komota” in pool play, it seemed to portend an easy victory. Kirby, in Smash 4 (community short-hand for the Wii U version), is a relatively low-tier character compared to Mario, who several top players use. Kirby players tend to bait and punish foes with heavy combos, which can be dangerous and effective, especially against an unsuspecting opponent. Due to its volatile, hot-cold play style and relative obscurity, few players have used Kirby in tournaments, opting for more reliable picks. In a best-of-three series, Carroza-Oyarce and Komota were tied 1-1, and on match point on the Final Destination stage, Kirby delivered the match-ending blow to Mario, sending him flying off the screen, and sending flying Carroza-Oyarce into the lower bracket. The look on Komota’s face? Priceless. Carroza-Oyarce will have a chance to redeem himself in the lower bracket of the singles’ pools, which will continue throughout the day. Komota advanced through to the upper-bracket, but lost his next match against Sonic player Joseph “Seagull” Raucher. Each now sits one loss away from going home in the double-elimination pools. 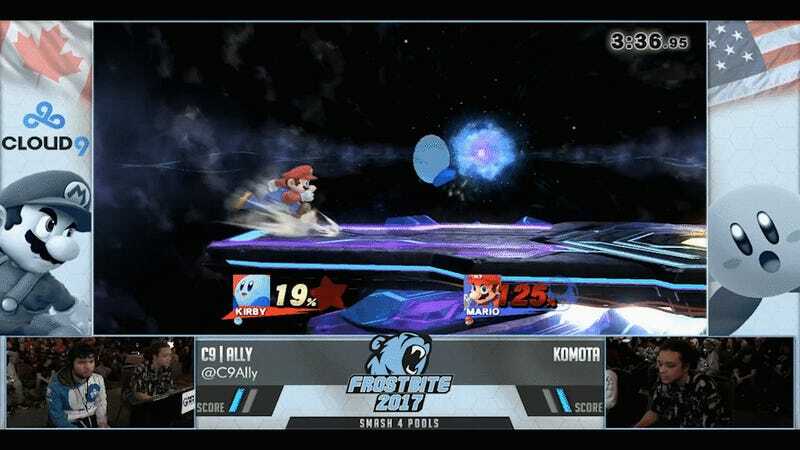 Frostbite 2017 features both singles and doubles competitions, the latter of which will have its finals tonight and feature teams like the star-studded tag-team duo of Nairoby “Nairo” Quezada and Gonzalo “ZeRo” Barrios. The full match is available here. You can follow more of Frostbite 2017 today and tomorrow on the Unrivaled Tournaments Twitch page.